In this March 25, 2019 courtroom sketch, former Hong Kong home affairs secretary Dr. Chi Ping Patrick Ho, center, is sentenced to three years in prison after he was convicted of paying bribes to presidents of two African countries in a United Nations-linked case., in New York. Hong Kong's former home affairs secretary Patrick Ho Chi Ping was jailed for three years Monday for a scheme to bribe African officials to boost a top Chinese energy company that was part of Beijing's global Belt and Road initiative. 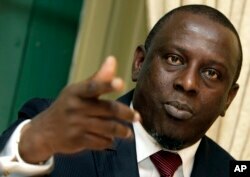 FILE - Cheikh Gadio, minister of foreign affairs of Senegal, speaks at the Swiss Press Club in Geneva, Switzerland, April 28, 2006. The two men allegedly offered a $2 million bribe to Idriss Deby, the president of Chad, "to obtain valuable oil rights," and a $500,000 bribe to an account designated by Sam Kutesa, the minister of foreign affairs of Uganda, who had recently completed his term as the President of the U.N. General Assembly, according to the charges. "Patrick Ho schemed to bribe the leaders of Chad and Uganda in order to secure unfair business advantages for the Chinese energy company he served," said U.S. Attorney Geoffrey Berman. "Foreign corruption undermines the fairness of international markets, erodes the public's faith in its leaders, and is deeply unfair to the people and businesses that play by the rules."